Dental general anaesthesia (DGA) is a very efficient treatment modality, but is considered only in the last resort because of the risks posed by general anaesthesia to patients’ overall health. Health services and their treatment policies regarding DGA vary from country to country. The aims of this work were to determine the reasons for DGA in the Helsinki Public Dental Service (PDS) and to assess the role of patient characteristics in the variation in reasons and in the treatments given with special focus on preventive care. The data covered all DGA patients treated in the PDS in Helsinki in 2010. The data were collected from patient documents and included personal background: age (<6, 6–12, 13–17, 18–68), gender, immigration, previous conscious sedation and previous DGA; medical background; reasons for DGA and treatments provided. Chi-square tests, Fisher’s exact test, and logistic regression modelling were employed in the statistical analyses. The DGA patients (n=349) were aged 2.3 to 67.2 years. Immigrants predominated in the youngest age group (p<0.001) and medically compromised patients among the adults (p<0.001) relative to the other age groups. The main reason for DGA was extreme non-cooperation (65%) followed by dental fear (37%) and an excessive need for treatment (26%). In total, 3435 treatments were performed under DGA, 57% of which were restorations, 24% tooth extractions, 5% preventive measures, 5% radiography, 4% endodontics and the remaining 5% periodontics, surgical procedures and miscellaneous. The reasons for DGA and the treatments provided varied according to age, immigration, previous sedation and DGA and medical background. The logistic regression model showed that previous sedation (OR 2.3; 95%CI 1.3-4.1; p=0.005) and extreme non-cooperation (OR 1.7; 95%CI 0.9-3.2; p=0.103) were most indicative of preventive measures given. Extreme non-cooperation, dental fear and an excessive need for treatment were the main reasons for the use of comprehensive, conservative DGA in the Helsinki PDS. The reasons for the use of DGA and the treatments provided varied according to personal and medical background, and immigration status with no gender-differences. Preventive measures formed only a minor part of the dental care given under DGA. Dental general anaesthesia (DGA) is a very efficient treatment modality, because it only takes a single appointment and requires little or no cooperation on the part of the patient. It is nevertheless considered only in the last resort, because general anaesthesia may pose risks for the patient’s overall health. General anaesthesia in early childhood has been reported to affect the child’s neurodevelopment, although contradictory findings have been reported[1, 2]. The American Academy of Pediatric Dentistry (AAPD) has stated indications for DGA in children and adolescents as follows: (a) patients who cannot cooperate due to a lack of psychological or emotional maturity and/or mental, physical, or medical disability, (b) patients for whom local anaesthesia is ineffective because of acute infection, anatomical variations, or allergy, (c) patients who are extremely uncooperative, fearful, anxious, or uncommunicative, (d) patients who require significant surgical procedures or immediate, comprehensive oral/dental care and (e) patients for whom the use of DGA may protect the developing psyche and/or reduce the medical risk. The AAPD and the Special Care Dentistry Association (SCDA) both emphasize that dentists should consider other techniques as alternatives to DGA and should use preventive care in order to find best treatment modality and achieve good results in the long term[3–5]. In Finland dental services are provided in both the public and the private sector, the entire population being entitled to Public Dental Service (PDS). Dental care for patients under 18 years of age is free of charge and nearly all children and adolescents receive PDS treatment. In Helsinki, DGA is provided by the PDS for ASA (American Society of Anesthesiologist) grade I-II patients, whereas ASA grade III-IV patients are referred to university hospitals. Conscious sedation is widely used when treating patients with difficulties in dental care, so that only those patients whose treatment would otherwise be very difficult are referred for out-patient DGA. At a consultation appointment preceding the treatment, a dentist specialised in DGA assesses, each patient individually in terms of the treatment options and needs, including proper instructions on oral self-care and dietary advice. Thus DGA is regarded as a comprehensive process, with preventive care included as one part. In addition to the AAPD indications, the Helsinki PDS indications for the use of DGA with children and adolescents also recommend this approach for adolescents who are at risk of alienation from society due to dental problems and the need for extensive dental treatment and for adults with intellectual, physical, mental or medical disabilities that could be overcome this way. The aims of this work were to determine the reasons for DGA in the Helsinki PDS and to assess the role of patient characteristics in the variation in reasons and in the treatments given with special focus on preventive care. The data covered all patients treated under DGA in the PDS in Helsinki, the capital of Finland, in 2010. The data were collected from patient referrals and other documents. Four patients were treated under DGA twice during the year and one patient three times. In these cases the multiple treatments were combined to represent one appointment. Complete documentation was available for every DGA patient. The personal background data covered age to an accuracy of one month, gender, whether the individual was an immigrant or not, and the history of previous conscious sedation and/or DGA. Age was categorized in the analyses into four classes: <6, 6–12, 13–17 and 18–68 years, the first three describing eruptional stages in the dentition and the fourth the age when patient started to pay medical fees. Immigrant status was defined in terms of nationality or native language. The medical background data were extracted from the free format text contained in the patient documents and referrals. Medically compromised patients were recorded under five headings, allowing multiple records to be kept per patient: (a) intellectual disability, (b) behavioural disorders, (c) mental disorders, (d) physical limitations such as diseases of the nervous system or senses or musculoskeletal or connective tissue, and (e) other chronic medical conditions such as endocrine, nutritional, metabolic, infectious, circulatory, cardiac, digestive or respiratory system diseases. Allergies and surgical operations were not recorded. Medically compromised patients were categorized as having intellectual only (a+b+c), physical only (d+e), or both types of compromising conditions. For further analyses the patient’s medical background was dichotomized as having or not having any medically compromised conditions. At the consultation appointment a DGA dentist assesses one or more reasons for treatment under DGA for each patient. The reasons were categorized for the present purpose as: extreme non-cooperation, extreme dental fear, an excessive need for treatment, avoidance of dental fear (for very young patients with no previous treatment experiences), large surgical procedures, a strong emetic reflex or ineffectiveness of local anaesthesia. Multiple reasons were allowed. The data on the dental treatments performed under DGA were based on the patients’ documents. We recorded the number of restorations (including stainless steel crowns), extractions and endodontics (pulpotomies and root canal treatments) and surgical treatments (included surgical extractions, lingual and labial frenectomies, surgical removal of cystic lesions, buccal exostosis, odontoma and benign lesions in the oral soft tissue, tooth exposures, autotransplantations, placing of Bollard plates, excisions of hyperplastic tissue and cleaning of the incisive canal). Prophylaxis included professional tooth cleaning and/or topical application of chlorhexidine or fluoride. In addition, fissure sealants, periodontal therapy and radiographs taken during DGA were recorded separately. Prophylaxis and fissure sealants were combined under the heading of prevention. Miscellaneous treatments included alginate and precision impressions, adjustment of occlusal appliances, immediate complete dentures and Schwartz plates, repair of periodontal splints and other minor procedures. The ethics committee at the City of Helsinki Health Centre approved the study and granted full permission for it. Individuals were labelled with consecutive numbers for identification in the data analyses. The statistical analyses employed Chi-square tests, Fisher’s exact test, and logistic regression modelling. A total of 349 patients (185 male and 164 female) were treated under DGA in the Helsinki PDS in 2010. Their ages ranged from 2.3 to 67.2 years, with 31% under 6 years of age, 35% aged 6 to 12, 9% aged 13 to 17 and 25% aged 18 years or over (Table1). Statistical evaluation by chi-square tests for differences by age group. The patients’ characteristics are shown by age groups in Table1. Immigrants predominated in the youngest age group, 51% compared with 25% in the 6-12-year-olds and 7-8% in the older groups (p<0.001). Of all the DGA patients 54% had previously received conscious sedation for dental care, with no age difference, whereas previous DGA was more frequent among the older patients (p<0.001). Medically compromised patients predominated among the adults, 86%, whereas the vast majority of the 0-5-year-old (88%) and 6-12-year-old (76%) DGA-patients (p<0.001) had no medically compromising conditions. The mean proportion of all the DGA patients having one or more medically compromising conditions was 39% consisting of 14% intellectual conditions, 10% physical, and of 15% both. All three categories became more frequent the older the patients were (p<0.001). The patient documentation revealed an average of 1.5 reasons for DGA per patient, 54% having one reason, 40% two and 6% three. Among the adult patients 73% had one reason for DGA, as compared with 48% and 49% in the two youngest age groups (p=0.002). The reasons for DGA by age of the patients are shown in Table2. The main reason was extreme non-cooperation (65%) followed by extreme dental fear (37%) and an excessive need for treatment (26%). This rank order was the same for all age groups except the youngest one, where avoidance of dental fear was the reason in 27% of cases and for 18–68 year-olds, where a strong emetic reflex was the reason for 15% of cases. Age was a powerful determinant for most of the reasons, but no gender-differences were found. For each patient, one or more reasons for referring to DGA were documented. Statistical evaluation by chi-square tests for differences by age group. F=Fisher’s exact test (F) applied. The three most common reasons for treatment under DGA are shown in relation to the patients’ characteristics in Table3. An immigrant background was more often indicative of an excessive need for treatment than a non-immigrant one (37% vs. 22%; p=0.005) and was less often indicative of a dental fear (27% vs. 41%; p=0.023). Those with previous experience of sedation more often showed extreme non-cooperation and dental fear than their non-sedated counterparts but less often had an excessive need for treatment. Likewise an excessive need for treatment was less frequent for those with previous DGA and/or medically compromising condition, than for those with no previous DGA (10% vs. 30%; p<0.001) or with no medical problems (18% vs. 31%; p=0.007). Statistical evaluation by chi-square tests for differences according to patient characteristics. A total of 3435 treatments were performed under DGA, of which 57% were restorations, 24% tooth extractions, 5% preventive measures, 5% radiography and 4% endodontics, the remaining 5% being periodontics, surgical procedures and miscellaneous. The mean number of treatments per patient was 9.8 (SD 5.0), ranging from 8.8 (SD 3.9) for 6-12-year-olds to 11.0 (SD 5.6) for 13-17-year-olds. Most of the treatments were restorations (5.6, SD 3.6) and extractions (2.3, SD 3.3). The percentages of patients who received each type of treatment are presented by age in Figure1. 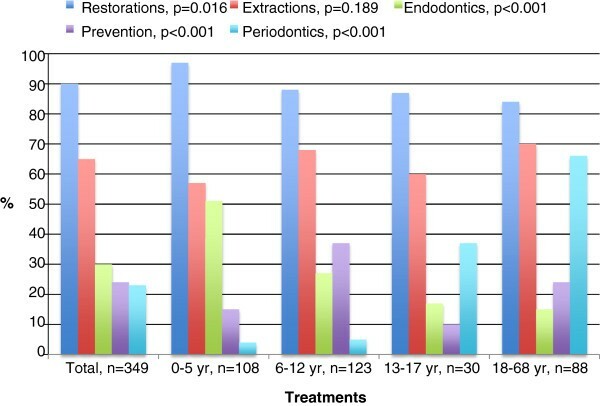 The youngest age group dominated those receiving filling therapy (97% vs. 84-88%; p=0.016) and endodontic treatment (51% vs. 15-27%; p<0.001), the 6-12-year-olds those receiving preventive treatment (37% vs. 10-24%; p<0.001) and the adults those receiving periodontic treatment (66% vs. 4-37%; p<0.001). Altogether 26% of the patients had radiographs taken under DGA. Percentages (%) of dental general anaesthesia patients (n=349) receiving various treatments, by age group. P-values refer to differences between the age groups. The treatments received under DGA are shown by patient characteristics in Table4. Being an immigrant pointed to filling therapy and endodontics more often than being a non-immigrant but less to periodontics, while those with previous sedation more often received filling therapy, preventive measures or periodontics than their non-sedated counterparts and those with previous DGA less often received filling therapy or endodontic treatment but more preventive measures or periodontics. The medically compromised DGA patients received filling therapy and endodontic treatment less often than did those without medical problems, but periodontic treatment more often. The treatments received by the patients are shown by reasons for DGA in Table5. Those with extreme non-cooperation, extreme dental fear or an excessive need for treatment received filling therapy more often than those without these properties, while endodontic and preventive treatments were more common for those with extreme non-cooperation and tooth extraction and periodontics for those with an excessive need for treatment. Statistical evaluation by chi-square tests for differences according to reasons for dental GA. The roles of patient characteristics and the reasons for DGA with regard to the provision of preventive treatment during the DGA session are shown in Table6. Previous sedation was more frequently indicative of preventive treatment (OR=2.3; 95%Cl 1.3-4.1; p=0.005) and tooth extraction less frequently (OR=0.9; 95%Cl 0.8-0.98; p=0.022). Extreme non-cooperation tended to be indicative of prevention, whereas extreme dental fear tended to result in less preventive measures. In the fitted model, age and gender were controlled for. Extreme non-cooperation and extreme dental fear were the most important factors leading to DGA, and should, therefore be taken into account and prevented early on in order to reduce the need for DGA. The present findings based on a unique body of PDS data covering all age groups support earlier observations that dental fear, non-cooperation, compromising medical conditions and the need for extensive dental treatment are the most common reasons for out-patient DGA[7–12]. From the parents’ point of view, dental fear and repeated unpleasant experiences during dental treatment can lead to a utilisation for DGA even in the case of healthy children. One of the commonest among the many reasons lying behind non-cooperation in children is dental fear. It has been reported in Finland that 21-36% of children are quite afraid or very afraid of something connected with dental treatment and that 5-19% of adults are very afraid of visiting a dentist, while correspondingly one fourth of adults in England reported that they definitely always feel anxious about going to a dentist. Non-cooperative and fearful patients need more time and effort on the part of the dental team. Many of the present patients had previously received dental treatment under conscious sedation, indicating that dentists had tried to treat their dental fear prior to resorting to DGA. As DGA does not diminish dental fear, as reported in children, dental fear needs to be dealt with after DGA. Patients in the Helsinki PDS are scheduled for a post-DGA appointment, which simulates a normal dental situation, with the intention of guiding the patient back to normal dental care. In addition, proper oral self-care instructions and dietary advice are provided over again. DGA in the Helsinki PDS context was a comprehensive, conservative process characterized by a predominance of filling therapy, endodontics and periodontics. Comprehensive DGA has earlier been reported in many European countries[8, 9, 11, 19–21], North America[7, 22, 23], the Middle East[24, 25], Asia[26, 27] and New Zealand. Contradictory findings have recently been reported from Australia and England, where DGA is used primarily for extractions in both children and adults[29–31], although a move towards comprehensive DGA care has also been made in the United Kingdom since the publication of the Royal College of Surgeon’s guidelines for the use of GA in paediatric dentistry in 2008. Nearly one fourth of the patients received preventive treatment under DGA, but the overall proportion of this, 5% was relatively small. One explanation may be that tooth extractions performed in this way do not allow prophylaxis at the same time. Fissure sealants and prophylaxis have been reported earlier as part of a comprehensive dental care regimen performed under DGA on children[7, 10, 11], but among our patients nearly one fourth of the adults received preventive treatment, too. Half of our adult patients had previously been treated under DGA, and 86% of the adults had a medically compromising condition, indicating that they belonged to a group whose dental care must necessarily be performed under DGA. Dougherty states that the decision as to which treatment modality is in the best interest of a patient with special needs should be made individually, but there is little evidence for what might be the optimal frequency of treatment episodes under DGA. Our findings were based on patient documents and referrals, which normally include no information about socioeconomic status. Immigration status is noted, however, and may be used as an indication of cultural differences which may affect oral health and related behaviour. The fact that immigrant children were over-represented among our young DGA patients is in line with an earlier report from Denmark. By contrast, an Australian report states that indigenous children have a higher risk of receiving DGA. To reduce inequalities in the use of health services, the Helsinki PDS has initiated multiprofessional collaboration in a programme that provides information on dental care and prevention for immigrant families and education in cultural disparities for PDS personnel. City of Helsinki statistics show that around 160 000 out of a total of almost 600 000 Helsinki residents were treated in the PDS in 2010 and that 349 of these were DGA patients, indicating that DGA is used as a last resort and only when certain strict criteria have been fulfilled. Our comprehensive data on DGA treatments provided during one-year are representative of the situation in the Helsinki PDS and may be generalized for the whole country, since Helsinki residents make up over 10% of Finland’s population. The data were based on the patients’ dental documents, the compiling of which is governed by strict rules in Finland. Extreme non-cooperation, dental fear and an excessive need for treatment were the main reasons for the use of comprehensive, conservative DGA in the Helsinki PDS. The reasons for the use of DGA and the treatments provided varied according to personal and medical background, and immigration status with no gender-differences. Preventive measures were more frequently performed on patients with previous experience of conscious sedation or extreme non-cooperation, but these measures formed only a minor part of the dental care given under DGA. The collaboration of the Oral Health Care Department of City of Helsinki is gratefully acknowledged. NS: designed the study, collected data and wrote the manuscript, SAS: designed the study and collected data, JIV: designed the study and wrote the manuscript, MMV: designed the study, performed statistical analyses and wrote the manuscript. All authors read and approved the final manuscript.